The Everest has been the industry's bestselling large-class liquid-cooled truckmount for many years. Featuring the Hyundai 4 cyl. power plant and the Gardner Denver TriFlow® Tri-Lobe vacuum blower, the Everest combines dual-wand capacity with precise temperature control. With easy access to components for simplified maintenance, the Everest is the perfect choice both for carpet cleaning and water restoration. Choose the best configuration for your needs. HP units feature 3000 psi solution pressure for the toughest hard surface and pressure washing jobs. All Everest models feature a 100 gal. waste tank. Add Prochem's e-idle option for significant fuel savings. Exclusive e-idle™ Intelligent Idle-down System saves up to 23% on fuel and reduces noise by automatically idling down when it senses the machine is not in use. Gardner Denver TriFlow® positive displacement blower. Outstanding vacuum for water restoration, dual-wand operation and long hose runs. Single or Dual Wand Operation. Use with a single 2.5 in. wand or two 2 in. wands for large commercial jobs. 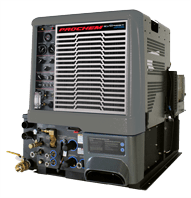 High Pressure Configuration creates up to 3000 PSI for pressure washing. Prefilter Box. Easy clean up between jobs without opening waste tank. Exhaust Deflector keeps hot exhaust off operator and out of vehicle. Aluminum Frame. Lighter weight and superior corrosion resistance. Auto Chemical Prime streamlines setup. Chemical Simulator makes switching between chemicals easy. Hot Water Tap fills chemical jug with hot water to improve chemical performance. Shutdown Identifiers diagnose the cause of shutdown to correct the problem limiting downtime. Electronic Fuel Injection eliminates the need for a governor, improves RPM stability and automatically adjusts for altitude changes.